The Amazing Virtual Sea-Monkeys was a licensed game developed by Creature Labs in 2000-2001, predictably based around Sea-Monkeys. It used a modified version of the Creatures Evolution Engine, with the major changes being in the image systems - the most obvious being that it uses BMP files instead of S16/C16 files. 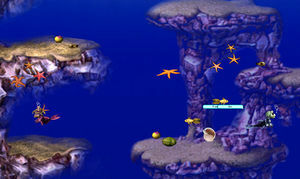 The game involved training, nurturing and playing with your Sea-Monkeys, who lived in a single metaroom consisting of a large and fairly plain rocky water area, which you could decorate with 'upgrades' such as food, small groups of fish and other aquatic life, and various more sophisticated objects, up to an environmental monitoring machine and a large castle. You paid for the 'upgrades' by using pearls, which you would have to obtain by using your Sea-Monkeys to pick them up from the game area. The game included a fairly hefty manual covering all aspects of the game, although apparently it was not included with all versions, and also came with a screensaver, which simply ran the game in a screensaver mode so you could watch your Sea-Monkeys swim around when not using your computer. The Sea-Monkeys in the game had an extremely simple genome consisting of only 51 genes, making up a very limited biochemistry system and no brains at all. Decisions, movement and the majority of other creature functions were entirely controlled by some simple CAOS scripts. The game uses PRAY, and agent developers can add their own upgrades and manipulate the world in other ways, although few have to date. The game wasn't very popular with reviewers, who disliked the artificial economy and found various other faults with the game. "If there’s anything good to say about this game, it’s that Xicat Interactive [the game's publishers] succeeded in perfectly recreating the experience of owning real sea monkeys. There’s the same wait for entertainment that never comes, the same waste of money, and the same bitter disappointment." The problem is that these aquatic pets are too much like real fish; there's only so much you can watch before you pass out from boredom. Creature Labs' own Creatures series is more interactive . . . At least in Creatures, the digital denizens could learn self-defense and deal with predators. By training them and helping them, the user does more than watch -- they are also nurturing and playing god, something strategy gamers love doing. Users aren't playing god in Sea-Monkeys; they're playing interior decorator." See the Amazing Virtual Sea-Monkeys Credits. Did you know? - Ian Saunter was once a fan of the real Sea-Monkeys, while Steve Grand (and either Mark Stamps or Mark Rafter) preferred tropical fish. NornenMeister converted a Tank from the game to a Creatures 2 world, The Albian Sea Bay. SM2DS was an early project to convert the world to Docking Station. Clohse created a DS metaroom in 2013, the Sea Monkey Marina. Grendel Man and Mea created a metaroom in 2014, Artemia Sea. This page was last modified on 11 June 2017, at 00:59.